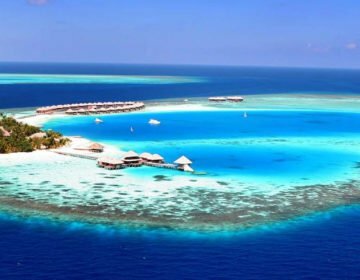 When it comes to experiencing the best spa resorts in the Maldives, Naladhu Private Island in the South Malé Atoll is one of them. Boasting only 19 exquisitely appointed villas and cabanas surrounded by thick coconut groves to ensure absolute exclusivity, the island of Naladhu is a tropical island paradise in the Maldives South Malé Atoll that promises unrivaled seclusion and tranquility. 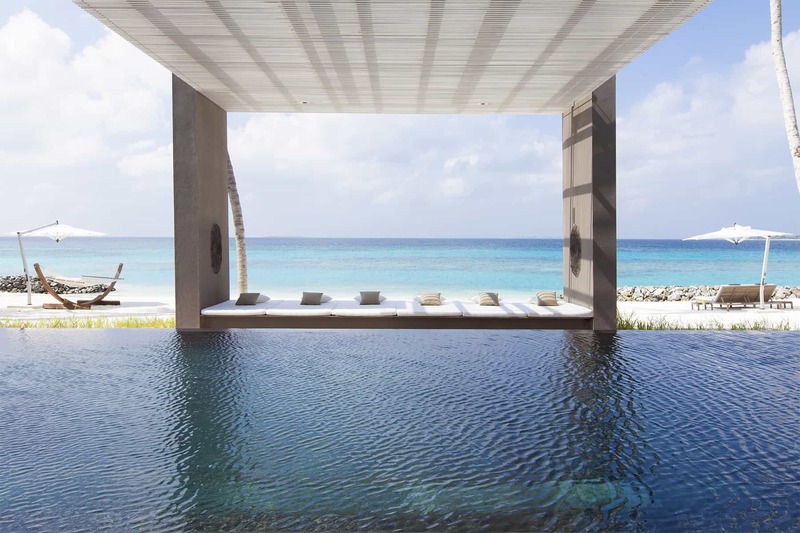 Elegant, weathered-wood villas and cabanas have lush private gardens, and infinity pools, and are surrounded by footprint-free white sandy beaches with beautiful oceanfront views of the turquoise waters of the Indian Ocean. Light and airy interiors are decorated in soft tones and tropical hues with spacious living areas that flow seamlessly onto outdoor wooden decks that float over the water. Cushioned Indian daybeds are for lying under the stars, and open-air bathrooms have sea-facing tubs for two and luxury L’Occitane products. State-of-the-art amenities include LCD satellite televisions, BOSE home theater systems, and around-the-clock butler service. Naladhu Private Island takes guests on a fascinating culinary journey in a variety of exquisite settings. Romantic dining is taken to new heights on Naladhu with gourmet breakfasts served all day and distinctive Thai cuisine from all four regions of the country along with and legendary Thai hospitality at Baan Huraa. Savor fresh seafood, seasonal fare and fine wines from the glass-walled wine cellar at the Living Room; or mouthwatering Maldivian flavors with your toes in the sand at a private candlelit dinner on the beach or lagoon-side on the ocean breaker’s private deck. Naladhu Private Island provides a unique Maldives spa experience at the rejuvenating oasis of the Ocean Retreat Spa, with private saunas, swimming pools and tropical rain showers, full body massages and exfoliating wraps applied by expert therapists. Exotic oils and natural ingredients fill the senses while the body heals and the mind is soothed by the lull of rolling waves. A range of signature treatments is also available, such as the five-hour beautifying Timeless Moments treatment, or the stress-releasing and reinvigorating Ocean Glow package. To book this incredible spa experience, click here. 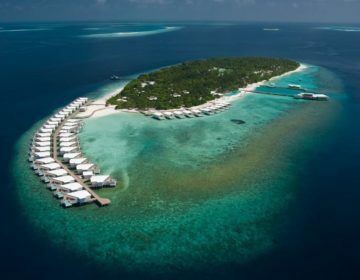 Surrounded by the picturesque beauty of the North Malé Atoll, the One&Only Reethi Rah is another one of the Maldives’ best spa resorts and a favorite with honeymooners and celebrity couples. Boasting 128 private thatched villas sprawled spaciously along white sandy beaches, tucked among the lush tropical greenery, or floating over the gin-clear waters of the lagoon on wooden stilts, the luxury resort has an elegant contemporary style, no less than 12 beaches, and the Maldives’ first ever sun spa. Home to some of the largest resort villas in the world, One&Only Reethi Rah features vast, deliciously secluded villas with huge soaring ceilings, light, airy living and dining spaces, wooden decks with sun loungers, white hammocks (idyllically swaying between palm trees), and shady verandas with awe-inspiring views. Floor-to-ceiling doors and windows framed with thatch fringes embrace breathtaking ocean views, and Grand and Duplex villas are exclusively accessed by over-water walkways and come with their buggies. From the quiet luxury of in-villa dining to a variety of idyllic dining venues around the island, guests are treated to out-of-this-world culinary experiences from the simple to the sublime. Savor garden-to-fork cuisine at the organic Botanica or dine on an eclectic menu of contemporary Asian, French and Italian fare at Reethi. Tapasake serves world-class Japanese cuisine against a backdrop of world-class sunset views, while Rabarbaro dishes up authentic Italian cuisine in a paradise-island setting. Head to Fanditha at the northern end of the island for a secluded and romantic dinner for two as the water laps your toes, or dine on simple salads, seafood, and steaks overlooking the turquoise lagoon at the Beach Club at ClubOne. Choose from three elegant and stylish bars for sunset cocktails, fine wines, and imported Champagnes, or enjoy butler-served dining on the secluded stretch of sand in front your private villa. Surrounded by lush tropical gardens and coconut groves, the luxurious One&Only Spa features private treatment villas and relaxation pavilions where ancient therapies and modern techniques are brought together to provide a soothing and restorative oasis. Expert therapists use authentic and indigenous methods to offer a comprehensive range of massages, body rituals and therapies, and facial treatments in a serene and tranquil environment. Designed to nurture and re-balance the body, the One&Only Signature Experiences range from Elevation and Restorative to Unwinding Experiences. 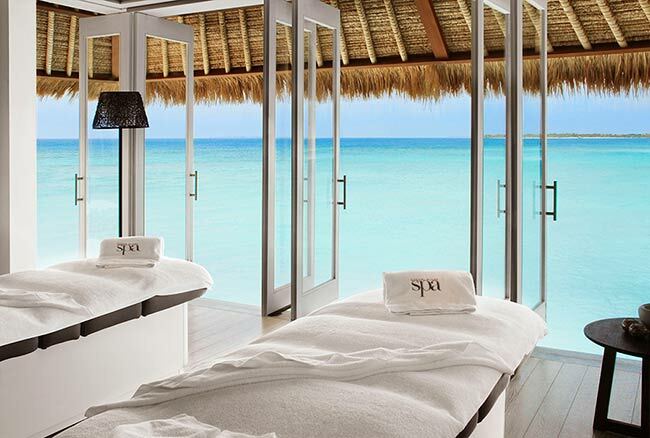 Book this spectacular Maldives spa hotel here. Nestled in the private island of Noonu Atoll in the northwest Maldives, and accessible only by private hydroplane, the Cheval Blanc Randheli is a luxurious escape for the senses. Following in the footsteps of the first Cheval Blanc resort on the slopes of Courchevel and designed by architect Jean-Michel Gathy, the exceptional resort is owned by the luxury conglomerate LVMH (owners of Louis Vuitton, Céline, Dior) and features 45 exquisitely appointed villas with infinity pools and breathtaking ocean views, five gourmet restaurants, an exclusive Guerlain spa and a range of extravagant amenities and whimsical touches. Floating over the water on stilts, nestled between exotic gardens or set on the powder-white sands of the island, villas boast open-plan living spaces with floor-to-ceiling sliding doors that let the incredible views in, as well as blissful bedrooms with designer amenities, terraces floating over the lagoon, outside dining table with sunken benches, and 12-metre-long infinity pools that seem to merge with the ocean. For those wanting absolute privacy and seclusion, Cheval Blanc Randheli Private Island is a dedicated one-hectare island with a private berth and jetty, and a four-bedroom villa with bespoke furniture and individual artworks and unique facilities including its spa, a 25-meter long outdoor pool, pristine beaches and exotic gardens. Named after Château Cheval Blanc’s most prestigious and sought-after vintage, Le 1947 signature restaurant pays tribute to French cuisine with a nine-course culinary experience in a sublime Maldivian setting. La Table de Partage celebrates the convivial art of dining together with private dining parties for 12 to 16 guests. Savor the finest Japanese and Southeast Asian cuisine and an authentic teppanyaki experience at the live-cooking theatre of The Diptyque where you can dine at one of the feet-in-the-sand tables against a backdrop of gorgeous lagoon views. Named after a Maldivian breeze and drawing inspiration from the surrounding Indian Ocean, the overwater Deelani is a lively Mediterranean restaurant with a relaxed alfresco-style ambiance that serves delicious tapas and freshly grilled seafood. 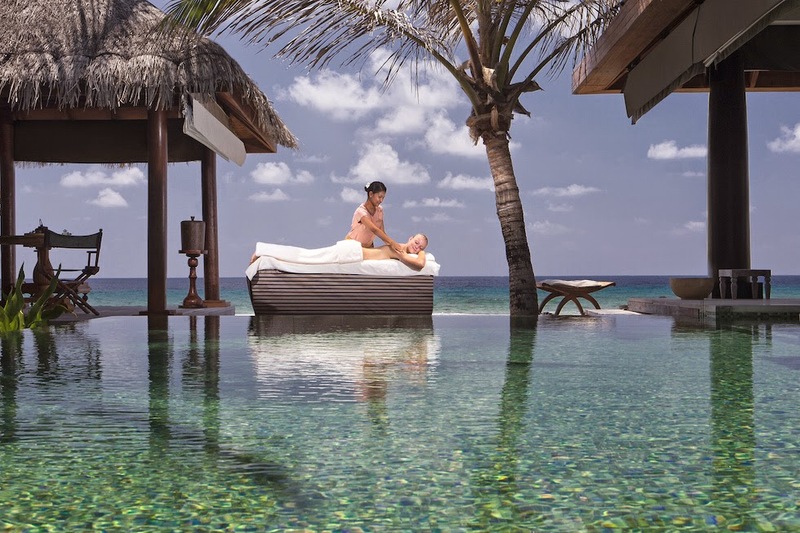 As expected at one of the best spa resorts in the Maldives, Cheval Blanc Randheli features an entire island dedicated to their Guerlain spa, which is accessed by dhoni and offers an ideal getaway for those seeking to indulge in a full day of pampering. A collection of unrivaled well-being and body enhancing experiences has been designed exclusively for the resort, ranging from spa rituals, traditional Hammam baths and yoga sessions to sporting activities and personally tailored culinary journeys. A Leonor Greyl hair spa and a make-up studio add sensory extras, and the Spa bar offers a selection of healthy snacks, smoothies, and juices, served next to the spa infinity pool. Dive into these beautiful waters at the Cheval Blanc Randheli by booking here. Rising like a phoenix out of the Indian Ocean in the Maldives, Dhidhoofinolhu is a tropical island oasis that is home to LUX* South Ari Atoll resort – a floating paradise of glistening, palm-lined beaches, pristine white sands and lush, tropical vegetation, and undoubtedly one of the best spa resorts in the Maldives. Capturing the very essence of luxurious island living, the island is paradise found, where exotic fauna and flora abound. Crystal clear waters beckon you to snorkel or dive along the untouched coral reefs while adventure-lovers can enjoy swimming with turtles and whale sharks, or sea-kayaking on tranquil waters. Epitomizing luxurious island-style living, the resort features beautifully appointed contemporary Crusoe-esque style suites and luxury villas suspended over the water to ensure an intimate and unforgettable experience. Designed for comfort and style, suites and villas boast modern décor that echoes the surrounding accents of this island oasis. Elegantly furnished to enhance the creature comforts of home with special extra touches, living areas have deluxe amenities such as air-conditioning throughout, fully-stocked mini bar-fridges, flat-screen satellite televisions, DVD players, iPod docking stations, and international dial telephones. Beautiful en-suite bathrooms enjoy lavish Jacuzzi baths and unique outdoor showers surrounded by verdant gardens, while broad timber terraces with private swimming pools offer magnificent ocean views. For unparalleled luxury, the Temptation Pool Water Villa is a must. Designed for couples wanting extra levels of privacy and seclusion and boasting unfettered sunrise views over the Indian Ocean, the magnificent villa floats over the surface of the ocean on stilts and features floor-to-ceiling windows and sliding door that seamlessly blends interior and exterior spaces and bathes indoor spaces in natural light. A spacious wooden deck terrace offers the perfect place for alfresco-style dining under the stars, along with a 14-meter rim-flow infinity swimming pool, and a private poolside cabana. Boasting no less than eight restaurants and five bars, dining is an experience in itself at LUX* South Ari Atoll. Savor authentic island cuisine of light stir-fry or seafood broth on the beach under thatched roofs at MIXE or be tempted with a Middle Eastern and Indian Ocean menu of rich tagines, tandoori prawns and tantalizing tropical sorbets at Senses Restaurant. Head to the Senses Bar and Lounge for post-dinner drinks cocktails, rums, and liqueurs, which can be sipped while swaying gently in a giant hammock. Escape to the Mediterranean with freshly caught seafood, hand-spun pasta, and other epicurean delights at Allegria, or lounge on catamaran nets floating above turquoise waters as you sip sunset cocktails at the hip East Bar with its secret under-the-sea-themed musical space for dancing the night away. Watch knife-wielding, grill-tickling chefs prepare fresh sushi and world-class sashimi at the chic and contemporary UMAMI or unwind to laid-back reggae vibes with a front-row view of the sunset at the sociable Lagoon Bar. 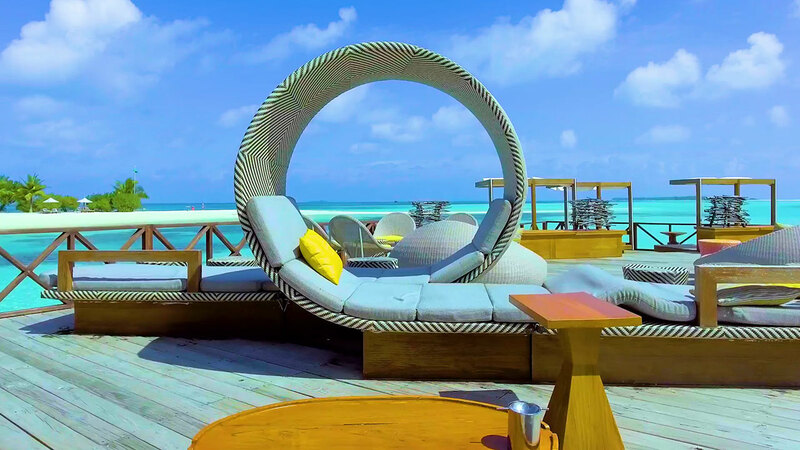 Enjoy light bites of hand-tossed wood-fired pizza and fresh salad with your toes in the sand and the lagoon breeze in your hair at the casual Beach Rouge or sip chilled cocktails or a glass of bubbly while soaking up shimmering lagoon views from the poolside Veli Bar. Coffee aficionados will delight at Café LUX* where they will find the finest barista-made coffee, including Cold Press, Pour Overs and Nitro coffee, day or night. A stay at the LUX* South Ari Atoll is all about indulgence and what better way to begin than with a range of pampering spa treatments, massages, yoga and meditation and facials. Overlooking the water with spectacular views, the resort’s exclusive LUX* Me spa offers a holistic, integrated approach to relaxation and tranquility with a wide range of massages, treatments and pampering sessions. Enjoy yoga and meditation sessions, signature Shirley Page or Balinese massages, pampering facial and body treatments with a world-class body or facial range, or indulge in an authentic Zhengliao Chinese Medicine Treatment, exclusive to LUX*. Stay fit with an SP&Co personal trainer who will personally create a tailored fitness program just for you. LUX* South Ari Atoll caters for health nuts with a range of healthy menu choices offering delicious, organic and natural food options, such as high-quality virgin, cold-pressed olive oil, sea and mineral salt, unrefined whole grains and flour, and fresh local fruit and vegetables. Guests can choose from wholesome vegetarian menus with vegan dishes, to gluten-free and lactose-free options, and more. Book here to experience the luxury of the LUX* South Ari Atoll.